Regardless of the size of the vehicle, backing up is often one of the most hazardous routines a driver has to do. There is a blind spot behind every car or vehicle. And the bigger the vehicle is, the bigger the blind spot. There is a reason why this blind spot is often called a "killing zone." You can cause bloody carnage if you are not careful. Even the US Department of Transportation is firmly backing the use of backup cameras, and not just in RVs either. From May 2018 onwards, this feature has been mandatory on all new vehicles. This is why you need the best RV backup camera on your vehicle. With one of these on board, you can drastically reduce the chances of mishaps and accidents while backing up your trailer. Especially on RVs, they are pretty much mandatory! If you are in the market for a new RV backup camera in 2018, we have the top five options available online at the moment here in our shortlist. Why use rear view cameras? What is a reverse camera and how does it work? 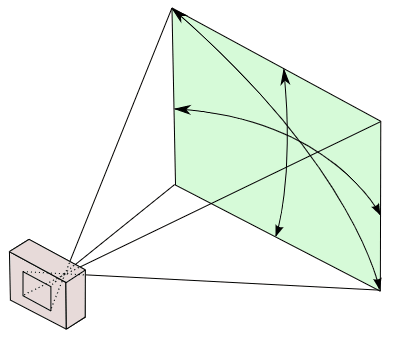 What is Field Of View (FOV) and why does it matter? What are the essential factors regarding camera sensors? Is there such a thing as too much Field of View? What are the mount options available? 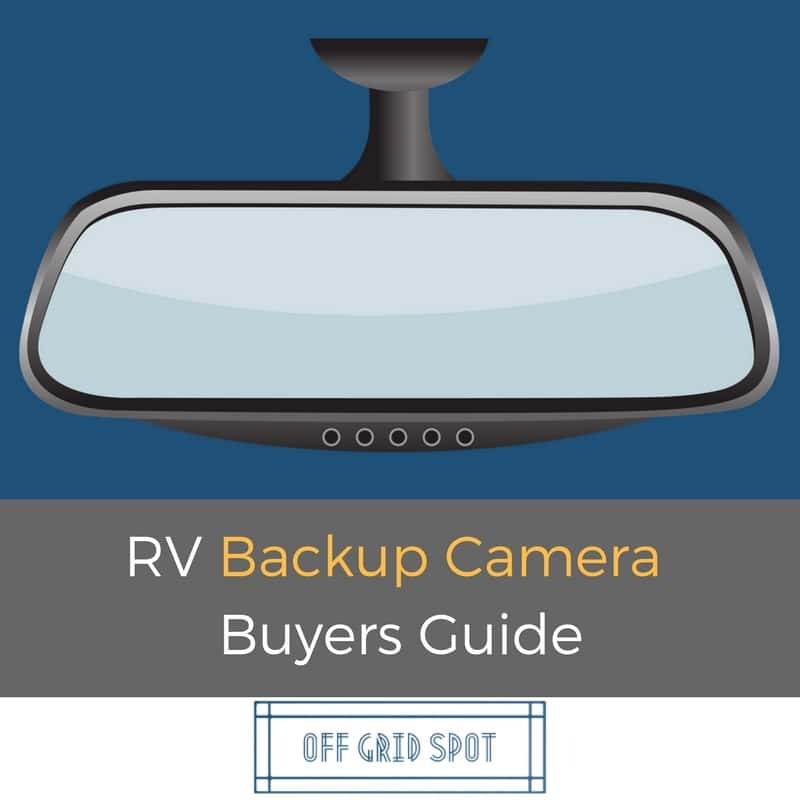 What are some other essential features to look for in RV backup cameras? Safety is the main reason why the Department of Transportation is making backup cameras mandatory on all new vehicles. Back in 2012, it was estimated that cars and trucks killed more than 300 people annually while backing up, many of them kids and seniors. This is a human cost that is too big to ignore. And the backing up procedure involving RVs and hitch and tow trailers are especially dangerous, as you have virtually zero visibility of the rear ends. Reversing and parking one of these behemoths is a nerve-wracking experience, especially if you are a beginner. Even if you don't hurt anybody, you can end up causing damage to property and your vehicle. This is why you need these electronic eyes on the back of your RV or hitch trailer. These days, we have cameras on even the cheapest mobiles. And most modern vehicles have elaborate dash decks with screens and all built in. The technology is effective and affordable. So there is no reason not to use a backup camera. Backup cameras are similar to the security and surveillance cameras we see these days. The main difference is that they are mounted somewhere on the rear of your RV, to give a full view of the space behind your vehicle. These cameras are then wired to a screen on your dash. If you already have a compatible screen on your head unit for GPS and navigation, the camera feed can be plugged into it. In this age of wireless technology, you can even find wireless cams that use Bluetooth or similar networking technologies to send feed data to your dash screen. These are the two main options out there when shopping for a backup camera for large trucks and RVs. Most modern RVs come with a GPS navigation unit on the dash. Large LCD panels are ubiquitous in this day and age. If your dash already has a screen, buying a camera and a monitor makes no sense. It is better to shop for a standalone camera that can connect to your existing screen using a compatible HDMI connector. But if your vehicle does not have a compatible screen on the dash, then obviously you should look at the packages that include both cameras as well as screen systems. 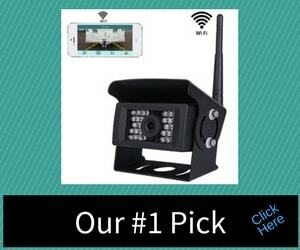 Another interesting choice is to buy a WiFi-based camera that can connect directly to your smartphone screen via a dedicated app. It is a hassle-free system that requires minimal wiring and installation headaches. For a camera, its field of view determines how wide the viewing angle you get from it. Naturally, when you are reversing or backing up your RV, having a wide field of view is beneficial. At the bare minimum, you should be getting at least 90 degrees of FoV from your camera. But these days, cameras with bigger sensors and wider views are available. Look for models with 120 degrees for better performance. The size of the camera sensor determines the quality of the image and the width of the FoV. This is true for all cameras, including backup cams. Sensors with ¼" size is capable of 90-degree FoV, while ⅓" sensors are better as they can deliver clearer and wider pictures around 120 degrees or more. CCD and CMOS are the two sensor options available in modern digital cameras. CMOS is the more affordable option, but it has less quality output with more noise. CCD cameras are pricier but offer more clarity in the video output. But they also draw a lot more power from your vehicle. So you factor in these different factors when choosing between CCD and CMOS. The main objective of an RV backup camera is to give you a clear view of what is directly in front of the path of a reversing trailer or RV. Some cameras may promise a wide-angled view, somewhere between 180-210 degrees. Frankly, that is overkill, as you don't need that much view at the rear of your trailer. They can actually make it harder to reverse, due to an effect called "fisheye lens effect." The image you get might be too distorted to be of much use. The effect is similar to peeking through a door peephole. That in itself is a sure recipe for disaster. Before you look at screens, check out the aux input on your existing SatNav or head unit. But if your RV is old and does not have such features, LCD is the only option out there at the moment. Look for TFT LCD screens for the best possible visual quality. Then there is the issue of screen size. As usual, bigger is better as they give you a clearer view. Sizes range from five inches all the way up to ten inches of screen space. Anything below this range is not worth the price. It would be better to spend less on a WiFi camera that can connect to your 4-5" iPhone or Android screen instead. This is one of the most common and popular options around. These cameras can be mounted on any flat surface at the rear of your RV. Ideally, you would want your backup cameras to be mounted up high. This way, you are guaranteed a good view with decent depth perception. If you want something sleeker and more discreet, flush-mounted cameras are a better option. The camera is kept inside, peeping through a hole drilled into the body of the RV. Only the bezel and lens of the camera may be visible from outside. This kind of system ensures that the camera is not that exposed to the weather and elements. But you may not be able to mount these cameras high on your RV. In this case, you do not have to drill any holes or make any modifications to your RV exterior. The camera uses the license plate hole for easy mounting. But that also means that the positioning is dependent on where your vehicle license plate is. Usually, the view you get is closer to the road surface. This is extremely important in a vehicle that will experience a wide range of outdoor conditions for an extended period. If the connectors and the camera body is not designed to withstand the punishing effects of the sun, dust, heat, rain, and snow, you will pretty soon have to shop for a new camera. Always check the product to ensure that it is weatherproof. Who says you will be parking your RV only in broad daylight? If you want to back up your trailer safely in darkness, in dawn, dusk, or night, look for a camera with night vision capabilities. 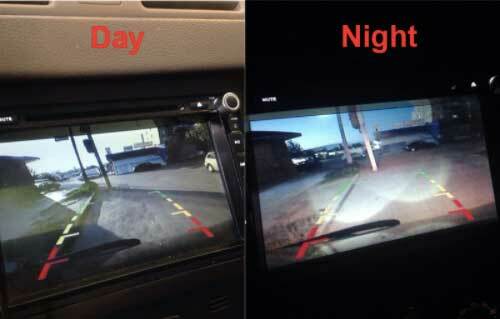 Most RV cameras use Infra-red LEDs to provide some visibility even in pitch black conditions. As drivers, we have been conditioned to use the rear-view mirror while backing up the vehicle. If you use the video feed straight from a rear camera, you will have to unlearn this. That's not an easy task. It is much better to buy a camera with image flip or reverse function. That way, you get the image on-screen like you would see it in a mirror. 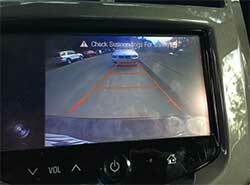 Virtually all backup cameras offer this feature. This is a high-end system from Furrion. The package includes digital backup camera and an LCD color display. The system uses its WiFi system to deliver video feed to the monitor on your windscreen or dash. Many modern RVs are available prewired for the Furrion system. Check your manufacturer specifications or the Furrion site for further details about this. Even if your trailer is not prewired, the package comes with detailed instructions for prepping the RV for installation. On pre-wired RVs, the installation procedure is a breeze. Either way, this is a nice high-end system to have for those 30-40 foot trailers. The range of the WiFi is rated around 100 feet, which ensures excellent performance when you are out on the freeway. The monitor system has a built-in CPU to produce consistent performance and video delivery. The size may seem like a significant inconvenience, considering that it is on the smaller side, under 5 inches. But it does have its advantages. Larger screens naturally take up a lot more space near your dash, which is not exactly a good thing. This 4.3-inch screen, on the other hand, fits snugly onto your windscreen and can sit close to the rearview mirror. Furrion also ticks all the boxes when it comes to durability and weather proofing. On the downside, if you already have a screen inside your vehicle, this unit will not help much as it is not compatible with other brand monitors. The video quality on the monitor also leaves a lot to be desired. The Furrion system has some nice features, but it is hobbled by some glaring weaknesses as well. If you rig comes prewired for this product, it is a decent option. If not, there are better systems out there. The main highlight of the ZeroxClub camera system is the large 7" monitor. It has a pixel resolution of 960*576, which is more than adequate for a backup camera feed. Behind the monitor is a dedicated processor for image stabilization and smooth and uninterrupted video feed from the camera. The camera included in the kit also deserves special mention. It has a decent viewing angle of 140 degrees, It has decent night vision capabilities, thanks to a series of IR lights embedded in it. Despite the use of a CMOS sensor, the images are of acceptable quality. One useful feature is the ability to move the viewing angles of the camera after installation. This feature will be helpful if you want to focus on specific objects/obstacles behind your RV/trailer. The camera is mated to the monitor using a dedicated 2nd generation WiFi system. The system is capable of working smoothly even on the longest 40+ foot trailers, where there is a considerable distance between the camera and monitor device. Installation of both units is also pretty simple. The monitor can be hooked to a cigarette lighter socket, while the camera draws power from your vehicle 12V electrical system. If you want the system to work automatically every time, you reverse the trailer, connect the camera to the red wire in your reverse lights. Overall the system works just right. Wiring is simple and hassles free, thanks to the detailed instructions in the manual. The image quality on the monitor is far better than many other similar systems out there. The camera is also very durable, with IP69 waterproofing. On the downside, the camera needs holes drilled into the vehicle exterior for mounting. The short brackets also make vertical surface installation difficult. Overall, the ZeroxClub system is one of the better all-in-one backup camera systems we have tested as part of this review. If you have a smartphone or tablet and don't want to deal with an extra monitor in your RV/trailer, then the SVTCam camera is an intriguing option for you. This is a standalone WiFi camera with a dedicated app. All you need to do is install the camera on the rear of your RV and download the app on your iPhone or Android device. The app will connect directly to the camera, giving you live feed on your mobile device. There are several advantages to such a system. With a fixed monitor you can only see the camera feed when you are inside the RV. With the 100 feet range on the WiFi in the SVTCam, you can get the video feed from both inside and outside the RV as long as you have the mobile device with you. The camera has a weatherproof housing and looks very durable. It has 28 IR LEDs inside for improved visibility in low-light conditions and even in darkness. Mounting and installation are fairly straightforward. You can hook it up to the 12-35V power system in your vehicle directly. If you want the cam to turn on only when you reverse, simply hook it up to the reverse light wiring. The manufacturer claims about HD video quality might be a little exaggerated, but it is still better than Standard Definition. The images are crisp and clear, especially since modern smartphones have excellent screens. The app also has screenshots feature, which is great value for money if you want to grab visuals for accident claims etc. The system does have a few weaknesses. Some mobile devices seem to have a hard time connecting to the camera. Also, the image is a bit dark, even in daytime. They need to improve that aspect of the product. But otherwise, this is an excellent value for money option for folks who want a backup camera they can access using their phones or tablets. If you want reliability, an old-school cable hook-up is always better than WiFi. Installation is undeniably more complicated, but once done properly, you don't have to worry about flickering signal strength. This is the reason why we have this heavy duty backup camera from Camecho on our list. This camera is a good option if your RV already has a screen/monitor on the dash. The Camecho camera package includes wiring for power and connection to the monitor. Depending on the size of your RV, you can opt for either the 32 feet, 50 feet, or 65 feet cable systems. As for the camera itself, it has a cheap CMOS sensor capable of delivering a video compatible with analog TV output systems. The video has a max resolution of 420 lines, which is similar to what you get on security cam footage. On the plus side, the system does come with night vision, thanks to the IR LEDs inside the camera. But as a cheap device, the Camacho does have its cons. The build quality is far from the best, and there is a high chance of fogging up due to moisture seeping inside. In this age of HD and 4K resolutions, the NTSC resolution with 420 lines may not please everybody. But overall, the Camacho provides decent value for the asking price. If you don't mind the low-quality video footage, the camera provides just enough practical value as a working backup camera. If you already have a compatible monitor, this is a good budget option for your RV. For those RV owners who need a bit more video quality than a cheap CMOS sensor, CCD is the obvious choice. And that is precisely what you get from this standalone backup camera from Rear View Safety. This camera should work with any RV dash monitor that has a video-in slot at the back. The ¼" CCD camera has a field of view of 130 degrees, which is par for the course among the best RV backup cameras. It has all the features you would expect from a top of the line backup camera. This includes night vision, mirror image, weatherproof casing, as well a built-in mic. The camera comes with a long power and video cable link. Mounting and installation are not too hard. The casing of the camera looks tough, and the overall build quality of the device is quite good. The casing has an IP68 rating, while the connectors on the cables are made from aircraft-grade durable materials. Overall the performance is pretty good, especially when combined with monitors sold by the same manufacturer. If you have a different make monitor, it would be best to check the compatibility first before placing your order. The installation process would have been much easier had the company provided a manual along with their product. Plus, their support network is not the best either, which further complicates the issue. You get 60 feet of cable, which is perfect for a long trailer or RV, but overkill for shorter trailers. All in all, if you want a CCD sensor camera the Rear View Safety cameras are worth they look. The user experience is much better if you already have monitors from the same brand in your RV. Picking the right backup camera system for your RV is no easy task. You have to take into account a lot of factors. If your RV or camper already has a monitor system installed in the dash, this complicates the matters further. Do you install another monitor for the backup camera, or do you try and find a camera compatible with your existing screen? These are all crucial questions with no easy answers, which is why we loved the SVTCam Wireless Backup Camera. It removes the issue of monitor screens out of the equation, by using your smartphone screen for the purpose instead. These days, we use our phones for pretty much everything, so why not use it for checking the video feed from your backup camera as well? The installation and mounting process is a breeze, and the long range WiFi system ensures that you can check the video even you are outside your RV, either in a tent in a campground, or relaxing at your home. But if you want a dedicated monitor, the ZeroxClub camera system is our product of choice. For standalone cams on a budget, the Camacho gets our vote.